Making Bay pools sparkle for 30 years! We're the largest, and longest-running pool service company in the Bay of Plenty. We're a 10-strong team of pool care specialists. For almost 30 years now, we've been helping our customers keep their pools healthy, crystal clear and sparkling - or doing it for them! Visit us at Hewletts Road, Mount Maunganui for a comprehensive range of pool cleaners, accessories, parts and products. Or let us come to you in one of our 6 'mobile workshops'. We can get your pool back to beautiful again, and even keep it that way with a regular pool valet service. If you need pool chemicals, call us to order and we'll deliver to your door - saving you time, and the potential danger of having hazardous chemicals sploshing around in your back seat. Delivery is free within the greater Tauranga area. We'll get your pool clear and sparkling, and we can also keep it that way for you! Bring a water sample in and we'll test it on the spot. Or have one of our Pool Care team come to you. You ring, we bring! We'll deliver your pool chemicals right to your (pool shed) door. We also offer FREE delivery from Katikati to Pukehina including Tauranga, Mt. Maunganui and Te Puke. 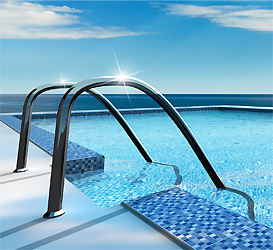 Sales and service of spa pools.